Los Delfines is a residential complex. Overlooking Playa Tambor,on the edge of the Pacific Ocean and located in the center of Bahia Ballena, Los Delfines is situated on 5,000 acres of exuberant tropical nature,surrounded by several protected natural reserves,allowing you to enjoy the harmony of a luxury resort.Los Delfines enjoys all the charms of a tropical setting of exceptional beauty with a beach which stretches for more than 3 miles,where mountain streams flow down to meet the sea. ATM bank,laundry facility, swimming pool, tennis and volleyball courts. Next to it lays the Hotel Barcelo Playa Tambor Resort and Casino. This Villa have two bedrooms, two bathrooms, air conditioning, CD player-radio, TV Cable, Phone, full kitchen equipped, dining room, they are five minutes walking distance from the beach. Tours: Scuba Diving, ATV Rental, Canopy Tour, Horseback Rides, Tortuga Island, Sport Fishing, Curu National Park, Cabo Blanco National Park. Tours of all the activities Los Delfines offers their guest are available in the front desk at your request. My wife and I rented this villa for a week in February. With 2 bedrooms and 2 baths, there would have been room for more people. It has a full kitchen, washing machine, safe, 3 TV's and WIFI. The Los Delfines neighborhood is a gated community in the middle of a golf course and with direct access to the beach. The 2 bicycles that are provided are nice for cruising the neighborhood. There is an abundance of wildlife in the area, as they have a very successful Scarlet Macaw breeding program, howler monkeys and we even spotted a small crocodile in the lake one night! Curu Wildlife Refuge is also just down the road for excellent hiking. Very easy to check in, as Edwin was accommodating to meet us at the gate when we arrived and showed us to the place, and was available at all times to respond to problems (we had none). There is a restaurant at the golf course, and many choices in Tambor and Paquera nearby. We were also able to economize by eating a number of meals at "home". Altogether a great place to spend a week! the most beautiful beach! Its not a 5 star place, but if you are not too fussy its fine. We're delighted you enjoyed your stay and we would love to have you stay again for your next adventure! 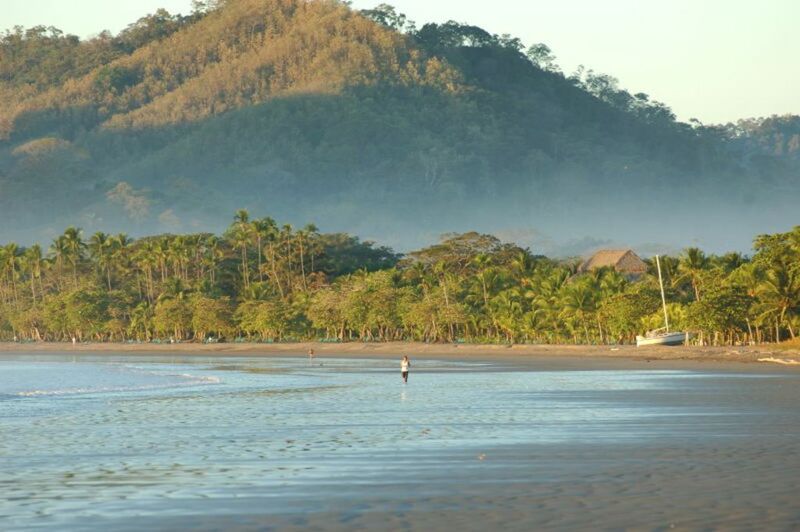 Golf: Enjoy playing Golf on a beautiful and challenging course in Tambor, Costa Rica. This spectacular course is situated in the midst of the tropical scenery of Los Delfines Golf & Country Club. AnaGolf (National Golf Association of Costa Rica) ranks it one of the top golf courses in Costa Rica. This region of Costa Rica keeps its lush, green, jungle scenery long into the dry season and this golf course reaps the benefits. The greens and fairways are some of the best in Costa Rica. Some of the most amazing scenery can be seen here with abundant wildlife and a large community of 72 Scarlet Macaws nesting throughout the course.